Colors explode throughout the forest along the road to Rock Lake in Algonquin Provincial Park in Ontario, Canada as Autumn arrives and prepares the trees for the cold months ahead. 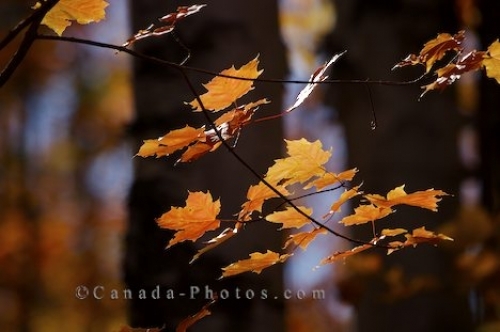 Autumn colored leaves cling on with their last bit of strength to one of the trees in the forest which tourists pass by while venturing to Rock Lake in Algonquin Provincial Park in Ontario, Canada. Hanging from the leafless twigs, small drops of water form, slowly dropping onto the forest floor. The different veins on the remaining leaves are easy to see as the sunlight shines through each one. In the backdrop, two trees are outlined with barren areas where the bark has pulled away as the rest of the forest is decorated in red, orange, yellow and green colors, the beauty of Autumn. Algonquin Provincial Park in Ontario, Canada is a very busy place during the summer but as Autumn arrives, buses are filled with tourists, cars pull in and out all day and others hike through the forest, all of them which have come to admire the Autumn hues. The road into Rock Lake is well packed gravel making it easy to access for any type of vehicle. Picture of the Autumn colors in the forest along the road to Rock Lake in Algonquin Provincial Park in Ontario, Canada.